I baked these in straight-sided paper muffin cups (found here ) then unwrapped the cakes and leveled the tops before frosting. These could certainly be made in a jumbo muffin tin, but I think they're pretty cute as mini cakes. 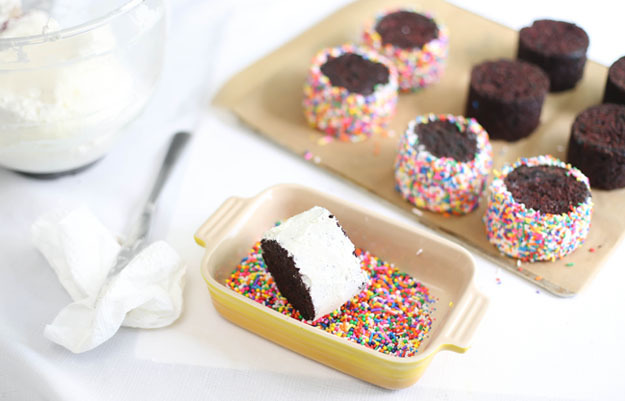 For the sprinkling of these cakes, I mixed together equal parts multicolored jimmies, jumbo nonpareils and regular nonpareils. You'll need about 2 cups of sprinkles for coating, so be sure to have plenty on hand before you begin. Getting the sprinkles on evenly can be tricky, but I found that frosting and coating the sides of the cake first works best. Then you can frost the top of the cake and sprinkle on more nonpareils with a spoon (see above). This recipe uses Swiss buttercream, and if you've never made this icing before you can check out my how-to video in this post. It's not as sweet as a quick confectioners' icing, and it doesn't crust so you can take your time applying the sprinkles after frosting. The Oreos inside are a nice surprise when you cut into the cake, and if you can find the Birthday Cake variety, the middles are dotted with sprinkles, too. A perfect match! Hey, these candies are called Dolly Mixtures back in the U.K.! I grew up with them, lot's of them. Love these mini cakes, awesome and cute! Where do you draw your inspiration from? I wish I were this creative! So pretty and dainty! Your dog is really photogenic. these are so adorable! I love the use of licorice all sorts, who would of though oreos and these could work? Oh how cute! 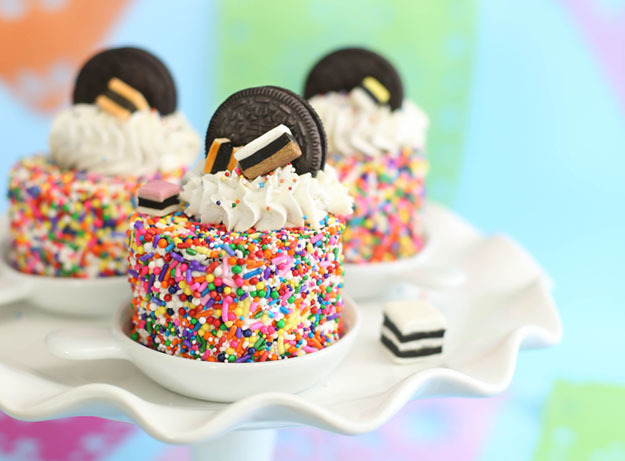 I LOVE sprinkles and these are just adorable!! :) Those photos really pop i just wish i had enough light to take photos like that! I love your works, you're so good! Well done! I love seeing all the cute things you come up with. Once again - adorable (the pugs too)!! These look absolutely delicious! 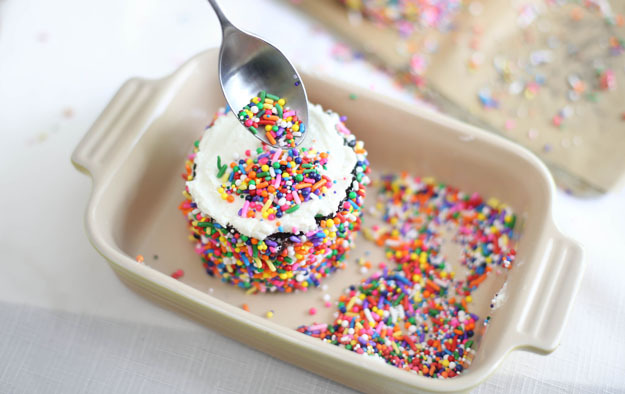 I love anything rainbow sprinkles and yours look so beautiful... Almost too pretty to taste... ALMOST. Thanks for all of your recipes and fun decorations! These are so adorable! I need to find one of those muffin pans! The dog... the cakes... so much amazing, adorableness happening in this post!!! That is the sweetest little cake I've ever seen! Well done. Super cute and I love how moist the cakes are! This is giving me great inspiration for my little one"s&b upcoming birthday! Thank you! 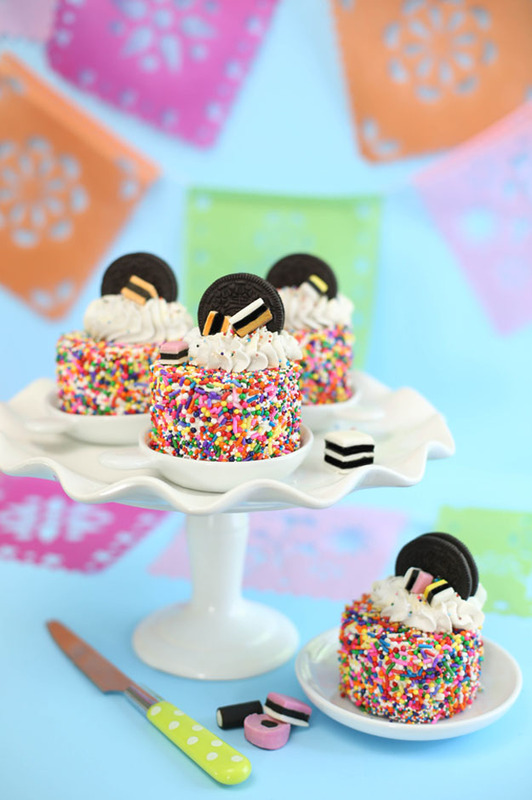 Your mini Oreo cakes are so cute and look very tasty! Bah!! so cute!! Love this idea! Very cute! I don't think the stores near me sell the bday oreos anymore, but definitely can still use regular ones! These are totally fabulous. Heather, you're a dessert wonderwoman! 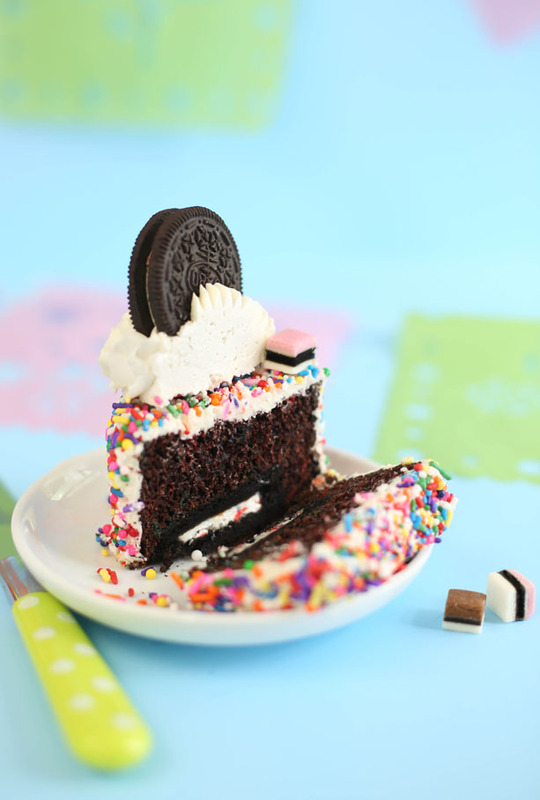 one can never have enough Oreo's or sprinkles--especially during the summer. I said it earlier today. Never enough sprinkles!!! Love these cakes, I want to make them now. These are so pretty..and hard to look at when you're on a diet! The paper ones are just too expensive to just throw away. I think that pan would work, but since it's cast iron the edges of the cake might get a little crispy. 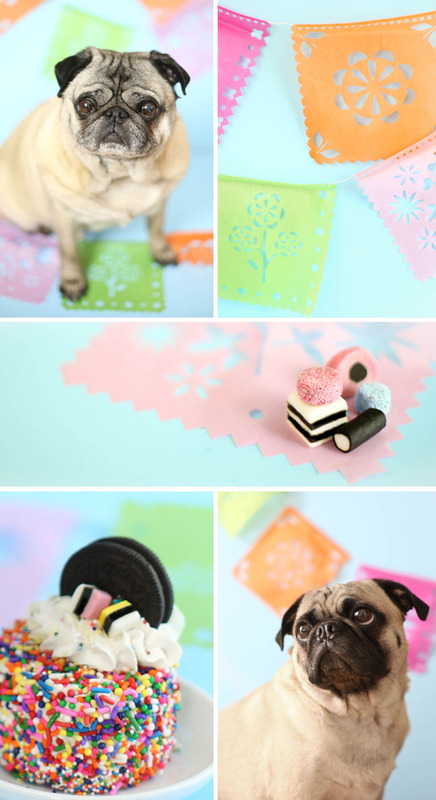 These are adorable little cakes, and your pug photos are just priceless! These are so cute, I like how's you've added liquorice allsorts on the top too, I love them. Thanks for sharing the tip of how to coat the sides with sprinkles, It seems easy enough to do with small cakes, but how do you go about doing so with a large cake? What a happy cake! and your blog exudes happiness! My dreary Friday has just been brightened up considerably. :) Happy weekend! I so admire your endless creativity. These cakes are so fun and adorable. It's a smile on a plate. I love these! Where did you get the little plates? I think I've seen them before with domes. Don't know which are cuter, the cakes or those pugs. Love! I love that little Oreo cookie surprise inside! What a fun little cake! These are TOO adorable! I`m loving the sprinkles as the decorations for the cake! I really appreciate your linking back to your swiss buttercream how-to. Sometimes when deciding whether or not a recipe can be tried, that's the deciding factor (whether or not I think I can do it). All in all, I agree with Lynna - these look way too cute not to at least try for my next party. Hi, where do you purchase the multicolored jimmies and nonpareils? I found several brands on amazon.com but worry they may not be a quality brand. I usually pick up the jimmies in the ice cream aisle at the grocery store. They don't dissolve or bleed on the frosting like others. I tried these today... no luck! The middles did sunk in more than I could fix with the filling. Bummer! Oh no! I'm sorry to hear that. Hard to say what happened. Such a cute idea, re-purposing cupcakes as proper full on mini cakes - these would be awesome for a colorful birthday party! Just wanted to let you know that somebody is posting these pictures and claiming them as their own. Thank you for letting me know! I appreciate that so much. Sadly, there's so much of this going on right now it's out of control. If not for kind hearts such as yourself bringing it to my attention, I'd never know. I'd at least like to know the facebook page name. I know I can get those removed, but I'm not so sure about IG. i don't have a stand mixer... unfortunately my kitchen is pretty small and it'd be hard to fit one in the storage space left, nor can i afford one right now. any advice on how to make the swiss buttercream without one? You can make this frosting with a hand mixer, but it may take about 10 minutes of holding the mixer upright, and mixing on high speed which can take a little endurance. Made these (very similar version, anyway) recently for my son...they were so fun and very tasty! The cake is so moist and chocolaty - a great chocolate cake recipe I'll be using again for other things. I used a simple buttercream frosting and turned a couple into simple cookies 'n cream cakes by adding crushed cookies on top instead of sprinkles. A hit all round. Thanks, Heather! Where do you find the straight lines muffin cups? These are so cute!